It was opening night for Swedish artist Richard Winkler’s exhibition Moments of Silence at the Leatris Room, Hotel Mulia in Central Jakarta, but many of the paintings were already marked by red butterflies, indicating that they were sold. Much of Winkler’s popularity derives from his choice of familiar themes – Balinese women walking home from the rice fields, men working in the rice paddies, fruit sellers in the market – and his technique of filling the canvas with vivid colors and voluptuous forms. It many ways, it resembles the Pengosekan style of Balinese painters. Art critic Amir Sidharta compares Winkler’s paintings with Claude Debussy’s music – his Red Coconut Trees with Debussy’s Nuages (Clouds), Winkler’s Orange Harvest with Debussy’s Jardins sous la pluie (Gardens in the Rain) – in that the French composer’s sweeping musical compositions often evoke visual imagination to the listener, whereas Winkler’s paintings are rich in musicality. “Winkler’s paintings to my eyes were Debussy’s music to my ears, so to speak,” Amir wrote in the exhibition catalog. On viewing Winkler’s paintings, one can understand what Amir meant by musical quality, not the cacophony of Wagner’s operas but the lyrical harmony of Debussy’s. Even something as transient as the lull of the day just before the sun sets is captured in his works. Born in Norrköping in 1969, Winkler’s artistic talent was inspired by his grandfather, a painter who taught him his first strokes. Winkler’s earlier works were focused on the lines and curves of the human body, the exaggerated curvature of the limbs, in particular. These later became more and more human-like after he moved to Bali in 1997. “In Bali, my figures changed and became more human-like with hands and faces, but at the same time more harmonious with nature. The light and the colors became stronger,” Winkler said on his website www.richardwinkler.com. The curves are still there, becoming Winkler’s signature style, in the terraced rice paddies, in the shape of the leaves and tree trunks, and even in the bulbousness of the mountains. 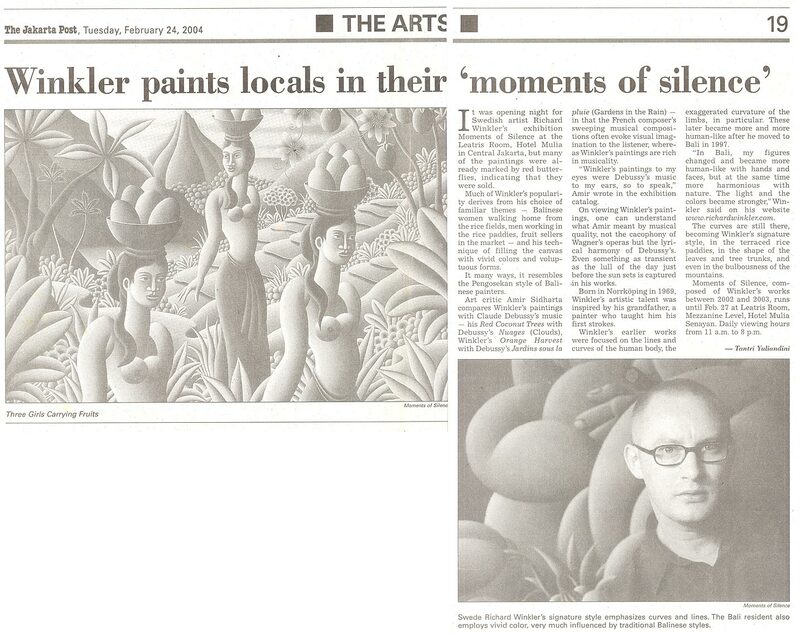 Moments of Silence, composed of Winkler’s works between 2002 and 2003, runs until Feb. 27 at Leatris Room, Mezzanine Level, Hotel Mulia Senayan. Daily viewing hours from 11 a.m. to 8 p.m.